File Name: Philip M. Hoslinger of Pittsburg, Kansas. Notes: Pittsburg is near the southeast corner of the state, about 30 miles northwest of Joplin, Missouri. Barricade is also the name of a Decepticon released in 1990 as part of the Micromaster Race Track Patrol. alphabetical: Barrel Roll << Barricade >> B.A.T. To my knowledge, Barricade was never animated. 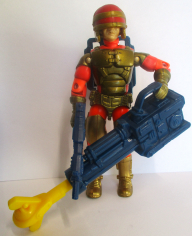 Accessories: dark blue "Z-99 battlefield sidearm" submachine gun with right-angle trigger guard and long magazine (new), dark blue spring-loaded "wall smasher" battering ram launcher with yellow trigger (new), yellow battering ram missile with Y-shaped tip (new), gold soft-plastic helmet with red visor and forehead (new), dark blue rectangular frame backpack for launcher (new), black figure stand (common). When Cobra takes over a city, it has to be won back block by block, house by house, room by room! BARRICADE, G.I. Joe's urban assault specialist, has nerves of steel and trip-hammer reflexes necessary for the job. Outfitted with a suit of flexible composite, laminate armor and a helmet with built-in infrared heat source sensors, Barricade can take on any Cobra agent in an urban environment and "knock his block off" with relative ease. Motto: "Never kick down a door that you can blow down with a Satchel Charge!" Toy Notes: Item #6741. In the 1992 insert catalog, concept art appears instead of the actual figure. 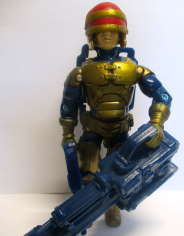 Accessories: dark blue submachine gun (92 Barricade's), dark blue spring missile launcher with yellow trigger (92 Barricade's), yellow spring missile (92 Barricade's), gold helmet with red visor and forehead (92 Barricade's), dark blue backpack (92 Barricade's), black figure stand (common). Accessories: black submachine gun (92 Barricade's), black full-head helmet with dark green visor and code name in white on forehead (new), black figure stand (common). 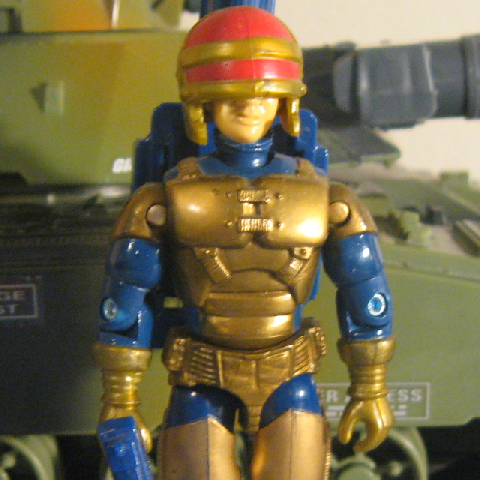 When COBRA forces take over a city, it has to be won back block by block, house by house, room by room. BARRICADE, an urban assault specialist with the G.I. JOE Team, has the steely nerves and trip-hammer reflexes necessary for the job. Outfitted with a suit of flexible composite, laminate armor and a helmet with built-in infrared heat source sensors, BARRICADE can take on any COBRA agent in an urban environment and "knock his block off" with relative ease. As COBRA forces infiltrate the cities to venomize more unsuspecting victims, BARRICADE takes control to seek out the bad guys and stop them before they complete their evil plans. "Never kick down a door that you can blow down with a satchel charge!" Toy Notes: Carded in a Toys 'R Us-exclusive set with Charbroil, Sgt. Mutt, Roadblock, Duke, and Sgt. Lifeline. Item #53914.